The FOSS tool known as VirtualBox is a popular alternative for easy virtualization in Linux. Many users are satisfied to spin up a virtual machine and start a system inside it,†but VirtualBox can do so much more. We show you some advanced tricks with VirtualBox. * Scapy – This cool packet analysis app integrates easily with Python, which lets you build packet analysis into your homegrown admin scripts. * Programming Snapshot – Mike Schilli explores the joys of building a homegrown progress bar. * Makerspace – Learn to use Waveform 9 to turn your Rasp Pi into a recording studio. * Linux Voice – This month includes a special article by Elvie cartoonist Mark Crutch on how you can create your own cartoon strip using open source tools. The VirtualBox virtual machine tool is a familiar sight on Linux systems, but many users don't access the full range of its powers. Elementary OS is an elegant Linux with a long-term vision and a focus on good design. Using the right tools can free you up to focus on the content you're about to create. If some transactions take an inexplicably long time, you don't have to blame yourself for the delayed transmission of user data. Name resolution issues might be the culprit. Charly has three tools to study the DNS server. If you like to customize your command-line file pager, check out most. Having trouble reading that scanned PDF? You can add a little more contrast with some help from ImageMagick. Progress bars keep impatient users patient during time-consuming actions. Mike Schilli shows how to create a homegrown progress bar. Run your favorite x86 programs on the Raspberry Pi. This graphical interface offers an easy way to customize open hardware keyboards. The Rasp Pi has enough performance to serve as a small digital audio workstation. 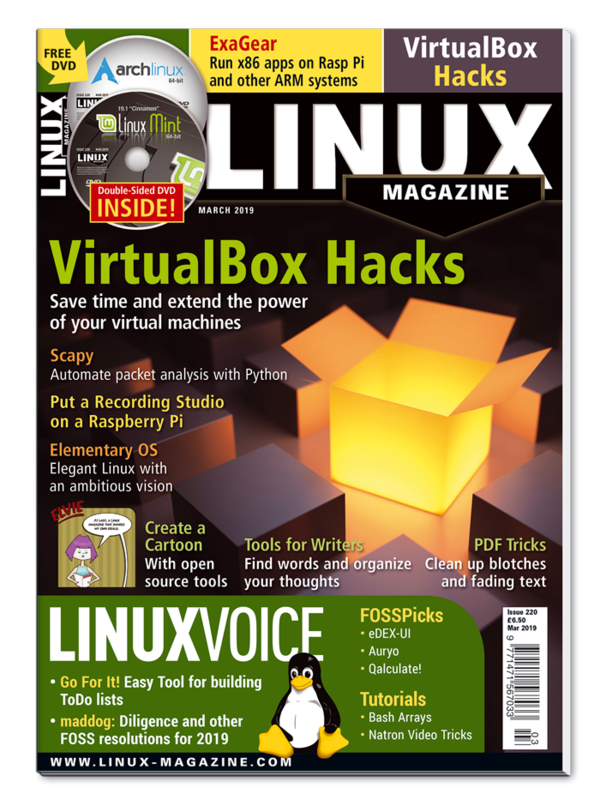 This month in Linux Voice. The Elvie cartoon strip in this magazine is created entirely using open source software. We take you behind the scenes to show you how. Is your to-do list taking all your time? Go For It! helps you work through your task list. Graham explores the retro sci-fi eDEX-UI user interface. Discover the data structures that make your shell scripts really powerful. Natron allows you to create eye-catching effects and combine different video clips in surprising ways.